Last Saturday night, Josh Warrington (28-0) successfully defended his IBF featherweight title in Manchester with a unanimous decision victory over Carl Frampton (26-2) in front of a packed house. The final scores were 116-112 twice and 116-113. Warrington captured the title in May when he outpointed Lee Selby in his hometown of Leeds and is now looking at even bigger fights. 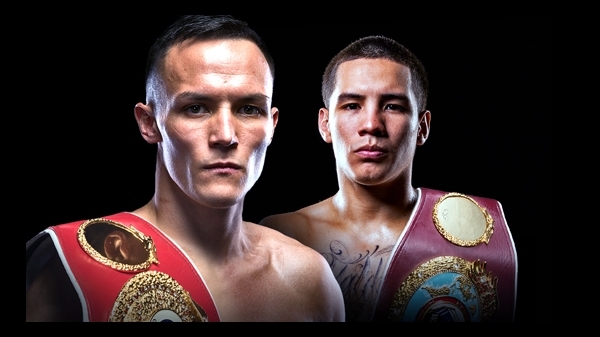 Prior to the fight Warrington’s promoter Frank Warren and Top Rank Inc. CEO Bob Arum said that they would like to match the Warrington-Frampton winner against WBO featherweight champion Oscar Valdez (24-0) in a Summer 2019 unification clash. Valdez will return to the ring on February 2nd against Carmine Tommasone in Texas in a main event televised on ESPN. Richard Commey and Isa Chaniev will fight for the vacant IBF lightweight title in the co-feature bout. Then the action switches over to the ESPN+ app where Eleider Alvarez and Sergey Kovalev will engage in a rematch of their August WBO light heavyweight title bout that Alvarez won via knockout. Lightweight prospect Teofimo Lopez faces former title challenger Diego Magdaleno in the ESPN+ co-feature bout. It will be Valdez’s first fight since suffering a broken jaw against an overweight Scott Quigg in March. If all goes well against the Italian, Valdez’s manager Frank Espinoza confirmed their interest in a bout against Warrington. “We are very interested in that fight but we are focused on Carmine Tommasone right now. Once we get through this fight then we can talk about Warrington,” Espinoza told BoxingScene.com. The fight against Tommasone will be Valdez’s first under the tutelage of Eddy Reynoso, head trainer of Canelo Alvarez. After being out of the ring so long, Espinoza hopes that Valdez can get some rounds under his belt before going into a major fight. “Oscar has been out of the ring 11 months so it would be nice for him to get some rounds in. This is only his first fight with Eddy so we will see some changes but not all at once. It will take a few fights,” said Espinoza.